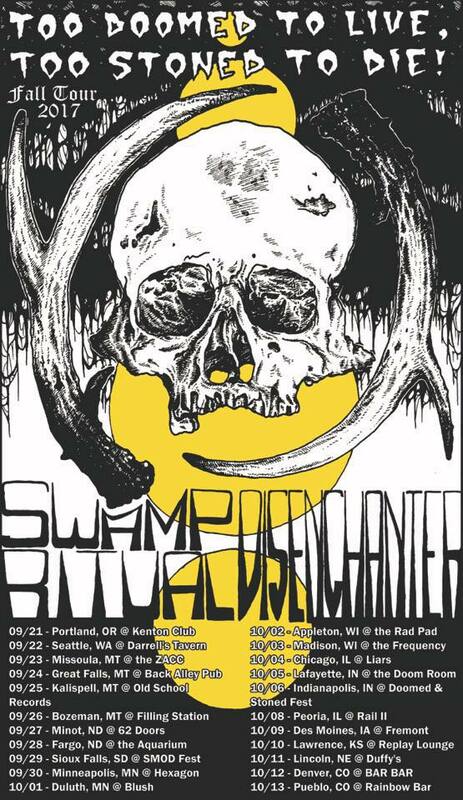 Sunchaser by Swamp Ritual The mighty Swamp Ritual hail from Missoula Mt. (as does yours truly), so I was more then pleased to see this 5 song gem of fuzzed out heaviness in my emails. Being a fan of the loud bass and drum duo since early 90's acts like Godheadsilo and later acts like Big business and Year of the Cobra, Sunchaser fits right in holding their own unique sound.. let the tripped out psychedelic 13 min Bearded Dragon take you for a little ride and you'll know what I mean. As I've stated here before I like things loud and heavy and Swamp Ritual are just that, as well as mixing tempo's with catchy foot stomping anthemic vox to straight no vocal sludge instrumentals. Catch them on tour 9-21 starting in Portland Oregon through 10-13 with one of my favorite bands Disenchanter. Buy the tunes with the bandcamp link below, its name your own price. And if you catch them live buy the merch and support your local venues. As I just witnessed in San Jose for Epicenter 2017, Heavy Rock is alive and well!